It's like Freddie Starr Ate My Hamster, only better. Or as I tell my non-knitting friends, as if the Sting of the knitting world bought my book! Very exciting. National Knitting Week is finally over! 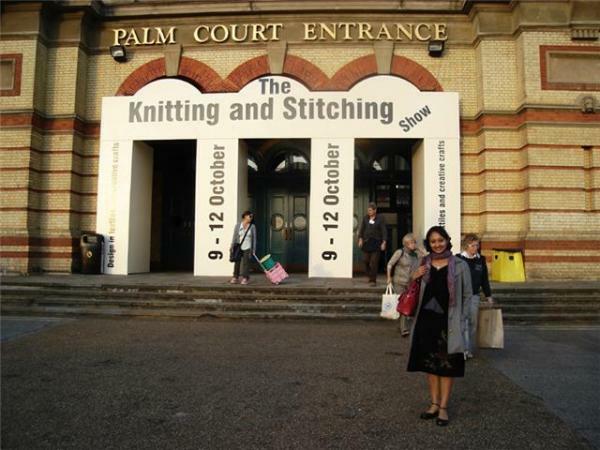 As much as I enjoyed being made a fuss over at the Knitting and Stitching Show at Alexandra Palace all week, I was on the verge of collapse yesterday and have never been so glad to see the end of a knitting event ever! We all had a great time. 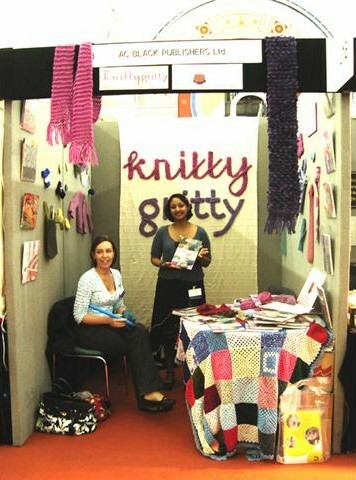 Often more chat and laughter than knitting, and lots of interest in Knitty Gritty. Lots of copies of the book sold and signed too - having someone pay for my book and want it signed will always be a huge thrill! Certainly on the first day, I gave an excited hug with every purchase. Dawn was a complete rock - bringing fivers, coming two days in a row and even going to the bank for me as a huge non-knitting favour. Dawn and Sam also made the funniest knitters as they knitted away the afternoon wearing mittens and wrist-warmers respectively. Knittin' in mittens - you heard it here first! Friday was a tough start (I hate public transport), but with Dawn again in full supportive form and Eiko chatting up the Japanese punters, I couldn't lose. Liva - a 14 year old from Latvia spent most of the afternoon with us - doing her part by teaching continental style knitting. Saturday was the best day of all. Knitting sisters Jayne and Debbie showed huge enthusiasm for the book - mostly because nearly all Jayne's family featured in it several times! They had such a great sales patter that I pretty much just sat back and watched the books fly away. I spent a fun and profitable hour with the ladies from the Women's Institute stand that morning. But the best part was when I got a phone call from the sisters calling me back to the stall to sign a book. I got there and said to them, 'do you know who this lady is? It's Debbie Bliss!' I always thought jaw dropping was an expression before, but that's what they did. 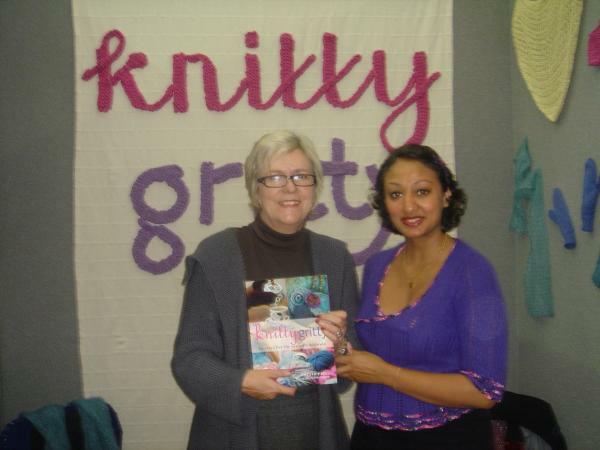 And I had the biggest thrill of the weekend in signing a copy of Knitty Gritty for the legend that is Debbie Bliss. She also shared some stories of heart rending mistakes in her books that made me feel like it happens to the best of us. What a lady! Saturday afternoon was when I finally got to meet Natalie - the sister of an old friend and so practically family to me. She seemed to have a great skill of knowing exactly when to pass me the dried mango just before I wanted to cry with exhaustion. Clever lady. Between Natalie and Amanda, Saturday afternoon ended the most fun day of the show. I also got to spend a little bit of my profits on some lovely red satin fabric that Jayne is going to teach me how to make a dress from. Slinky, red and just cleavagey enough! Sunday was the most hard work I've had to do in a long time. I was so tired and confused that I managed to get on the wrong bus to Alexandra Palace in the morning. I ended up in the fog in the middle of Nowhere, North London. Thank goodness a taxi came by as I'd have been stranded for ages otherwise. Upon finally arriving at Ally Pally, I realised I'd forgotton my sandwiches and of course burst into tears. I was like an over-tired, tantruming child by this point. This is how Karen and Michelle found me and hurriedly soothed me with kind words, hugs and a tidying of the book display. Another couple of knitting celebrities came by on Sunday. Miriam Tegels, the world's fastest knitting dropping in to say hello. And she bought Jennifer, Miss DomiKNITrix herself with her. http://www.domiknitrix.com/ All exciting stuff. I spent most of the rest of Sunday in a bit of a daze. Too tired to look around the show and slumped in a corner until a punter came by, then suddenly, scarily switched on. Thank goodness for a ingrained work ethic to get me through times like that. Hayley and Clare in the afternoon saw the very worst of me. But they rallied around and the show would still be up there if they hadn't climbed on chairs, lugged boxes and generally organised me into a taxi. I'm very glad I took part in the show. I could never have done it without all the help from everyone who came along - volunteers, A&C Black, knitters, students, passersby and other exhibitors. But I'm just as glad it's over! My flat never looked better after seeing it only for a couple of waking hours each day for the last week. Thank you. Over and out.